Tales of heroism are emerging after a mass shooting at a Florida high school on Wednesday left 17 people dead. Staff at the school have been praised for protecting students as they were forced to hide under desks and in cupboards to avoid being shot. One teacher was killed while attempting to barricade a classroom door. Nikolas Cruz, 19, confessed to carrying out the attack at Marjory Stoneman Douglas High School in Parkland and has been charged with 17 counts of murder. 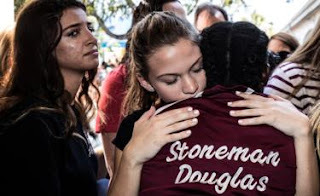 Students have been sharing their stories of the attack - the deadliest US school shooting since 2012 - and how many more people could have lost their lives had not been for a number of brave individuals.